The village of Eidfjord in Norway stands at the top of the fjord of the same name on sandy ground at the mouth of the Eio River. Behind the village are strange gravel and sand terraces, left some 9,000 years ago when the inland ice melted and flowed away. The charming church bears the inscription 'Ragna Asulfsdatter built this church - she died on Christmas Eve'. Folklore has it that the lady built the church in the 12th century as an atonement for killing her husband! Hardangerfjord is situated in the picturesque county of Hordaland and is the longest fjord in the world. Visitors can take a fjord cruise and see one of Europe's largest mountain plateaus, and one of the most impressive waterfalls in Norway, or go glacier walking on the Forgefonna Glacier. Other activities to do in the area include hiking, kayaking, and cycling. Explore the history of the local culture at the Hardanger Folk Museum, discover how juice and cider is produced at the Cider Factory, or visit the Renaissance garden at The Barony in Rosendal. The region is famous for its beautiful scenery with high mountains and blue fjords, of which the Geiranger fjord is one of the most attractive tourist places in Norway. The climate is less severe than might be expected from its geographical location, with mild winters and cool summers. Ålesund, with its unique architecture, is the center of business and industry in Møre and Romsdal. As the sea, the woods and the mountains are easy accessible, the possibilities for outdoor and sports activities are excellent, both in the summer and winter season. The Geiranger Fjord is a unique and exceptionally beautiful fjord – which is why this fjord landscape is included on UNESCO’s World Heritage List. Seydisfjördur is long and narrow and flanked by high mountains. At its head lies the town of Seydifjordur, which has one of the best natural harbors in the country. The oldest part of the town is built in 19th century Norwegian-style architecture, making Seydisfjördur a unique Icelandic fishing towns. Seydisfjördur is close to the Faroe Islands and Europe. 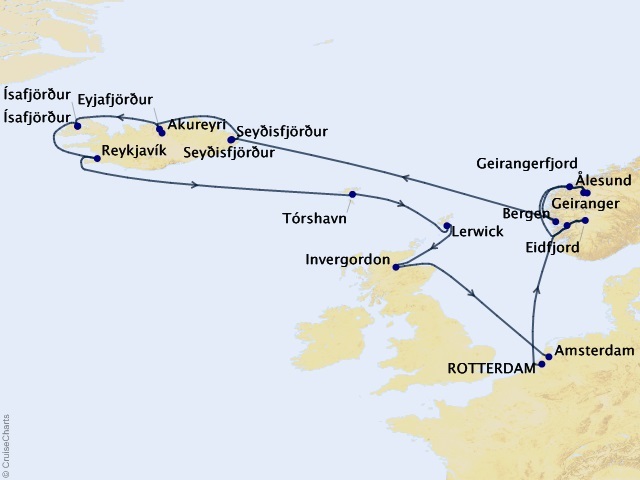 A Faeroese passenger and car ferry has operated scheduled weekly sailings between Seyðisfjörður and Scandinavia during the summer, and this has attracted considerable tourism to the area. The cultural life is very lively during summer. The Á Seyði Art festival is a yearly event. The Blue Church has concerts every Wednesday in summer. Art exhibitions are at the cultural center, and there is a Crafts Market. There is a swimming pool, a golf course, mini golf and the Rarik electricity museum. Also offered are guided sightseeing tours, cruises, sea angling tours, and trips to Lodmundarfjördur fjord. There are a variety of marked hiking trails in the area, and fishing licenses are available. Eyafjordur is the name for the spectacular, Icelandic mountain range that shelters the town of Akureyri. Eyjafjörður is a starting-point for exciting adventure tours to some of the beautiful nature reserves in the Northeast of Iceland. The Eyjafjörður area is also ideally suited for hikes in places such as the Tröllaskagi mountain range, or the wooded park of Kjarnaskógur. The town of Isafjord is a bona fide hive of industry. This busy fishing port runs to sizable shipyards as well as shrimp and fish factories— all ready to handle the catch of the day from the icy waters of the Denmark Strait. Recreational activities around here include hiking, kayaking, and of course, fishing. Approximately one third of the 50,000 residents of the "Sheep Islands" live in Torshavn. The city has large fishing industries, a seat of a Lutheran bishop and boasts many museums and culture. The Shetland Islands are Great Britain's most northerly islands, situated nearly fifty miles northeast of the Orkneys. Lerwick is the capital of the principal island of Mainland and is Britain's most northerly town. Founded on the fishing industry and with strong Viking connections, little now remains of the old village of Lerwick. Features of interest include the Cromwellian Fort Charlotte and annual Norse fire festival, Up-Helly-Aa, held every January. On the southern tip of the island is Jarlshof, site of ruins of several Stone Age and Bronze Age dwellings as well as wheel-houses from the Iron Age. Elsewhere on the island is Clichimin Broch, another prehistoric site containing a Bronze Age fort. Rates are cruise only, per person, based on double occupancy. Taxes, Fees and Port Expenses of $314 additional for all guests. Fuel surcharges may apply. Please ask your travel counselor for details. Rates are subject to availability and may change without notice. Restrictions may apply.